Electronic Health Record (EHR) adoption has not been an easy undertaking in the Healthcare industry. Over the last decade, adoption has been tumultuous and highly variable when you analyze the entire spectrum. Physicians on one end of the spectrum argue the inefficiencies while others are quick to adopt. New graduates are well equipped and complete rigorous training in Medical School to prepare for a career mandating electronic documentation. In fact, by year end 2017, 67% of all providers reported utilizing an EHR. It is important to note that effective EHR systems minimize impact on providers. Pediatrics leads the charge with 76% utilization rates. Specialties in the shadow of Pediatrics include: Nephrology (75%), Family Practice (75%), and Urology (74%). Adoption across states has been highly variable as well. Wyoming leads the charge with utilization rates as high as 79%. States in Wyoming’s shadow include: South Dakota (77%), Utah (75%), Iowa (75%), and North Dakota (74%). It is important to note, over the past five years, EHR adoption increased from 40% (2012) to just over 67% (2017). EHR software companies (e.g. NextGen) are working vigorously to provide end-users with tools that will minimize impact on end-users (e.g. Providers). Minimizing impact on your Providers will allow them to focus more on the overall quality of care that is being provided. With that being said, I want you to ask yourself if your organization is maximizing utilization of your EHR Solution. At the end of the day, the more responsibility you can shift to the patient, the less impact on ancillary staffers and Providers alike. 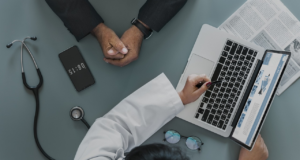 Automation can help shift these burdens from your medical staff to the patients in an effort to expand access by increasing overall throughput. Knowing underutilization is a major issue, it’s important for your practice to ask some additional questions. Are you utilizing patient check-in kiosks? Do you promote Patient Portal utilization? If so, what components of your Patient Portal are currently configured and actively being utilized? Have end-user preferences been configured by job duty? Have medication preferences been configured to allow for seamless transmission of electronic prescriptions? What percent of your staff setup favorites and defaults? To learn more about how EHR systems minimize impact on providers and the options and benefits available, contact one of our product experts at 1.800.860.4427 or at marketing@gbscorp.com.